What do you do when you see bugs outside? My three-year-old used to shriek and try to step on every ant and run away from worms. Although many of us, as adults, often feel the same, taking the opportunity to learn about bugs and other creepy crawlies with your child is a fantastic way to get outside and into nature. In our home, we talk a lot about how bugs are our friends. We acknowledge that outside is their home, so we will treat them kindly and leave the “grumpier” bugs (bees, wasps, spiders – the ones that could hurt) alone. Here in southwest Ohio we get large batches of cicadas that emerge every few years. It’s a fascinating, albeit in a gross way, sight to see: cicada nymphs, which look like brown beetles, crawl up out of the ground. As they reach the tips of blades of grass or begin their ascent up tree trunks, they split their backs and the adult cicadas emerge. The cicada “shells” that are left are a great way to introduce young children to bugs – they still look like insects, but aren’t alive and don’t move. We took a magnifying glass outside and my toddler first just looked closely. Eventually he decided to touch one. When it didn’t move, he got braver, and picked one up. Soon, he was rotating it, looking all around, counting legs and giggling. Today, we found a giant insect (specifically, a green june beetle, which was almost an inch long!) that was eagerly scooped up. He chatted with the beetle for a bit (“Hewwo, beedle. I am bein’ kind to you!”) before it spread its wings and buzzed away. Start small and gradually increase knowledge, both yours and your child’s, of different bugs in your area. Soon you may find yourself bug watching regularly! 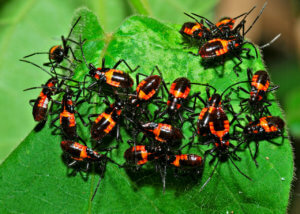 Learn more about insects in your area at http://www.insectidentification.org (you can search by state, or even by describing insects you’ve found).